Why don't we all have amazing building quotes examples already? Building quotes are critical documents for every company working in the construction and building industries. Building and construction are industries which rely heavily on quotes and tenders, primarily due to the nature of their work: being project-based and delivered over a reasonable length of time. And building quotes are the glue and formal mechanism for bringing two or more parties together to agree on a price which works for those parties. Given the importance and frequency of quoting in the building trade, you would think that companies and workers would have a smooth quoting process which is streamlined and professional. But the truth is that managing quotes, especially in the face of thousands of other urgent moving pieces isn't easy. And construction companies don't specialise in document or quote management like more sales or marketing oriented companies. This is why not all building companies have amazing building quotes examples (nor do many companies in other industries either). Because of this, many construction and building companies look for reliable and professional examples and frameworks which they can use and leverage for their own quotations. We are here to offer you a few building quotes examples which can be copied or used for your building quotes. Every company's quotes are a little bit different, just as their projects are different, so these building quote examples are flexible and customisable for you too. Read on to see and use the examples. It's really helpful to look at other building quotes examples when assembling your own quote template. But using these exisiting templates and samples properly is it's own art. You have to figure out which part of which frameworks you like, and incorporate them into your master template which you can use across all or most of your projects. The more standardised your document becomes, the more reliable and predictable your outcomes will become too. You don't want to lose a single job due to the quality or layout of your quote. You only want to lose jobs because you are too expensive or too cheap. So let's jump into the building quotes examples. The first one of the building quotes examples below is for a new apartment build. What you'll notice after looking through these two quote examples, as well as many others, is that there is a few critical pieces of information which your building quote needs, and the rest of the document is made or broken by its formatting. The main differences which you will encounter across different building quote examples is the level of detail in regards to the scope of work or project schedule. Some clients and asset owners will demand a lot of detail in their quotes, while some suppliers will include this detail. The makeup of this section will be largely dependent on how many other documents are being provided and dealt with during the planning and delivery phases. What's really important about this specific apartment building quote example is the level of detail provided in the cost structure breakdown. 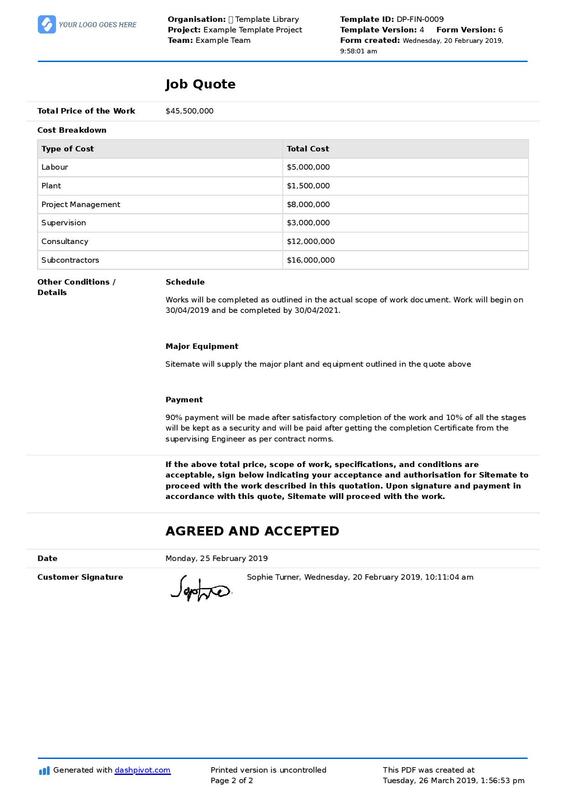 The format of this document makes it possible for the quote preparer to include very specific parts of the project costs, and group them into understandable categories. This framework is also infinitely flexible, so the building company can easily add new table subitems to the quote, or create new categories for different types of projects. The purpose of a building quote is to communicate how much something will cost, and to make it seem like a good deal. Asset owners and operators can be easily confused and can quickly become suspicious and untrusting of quotes which don't go into sufficient detail. Your number one goal in creating a building quote, and in establishing your building quote framework, is to appease the client or receiver of the quotes worries - and help them feel like you are being fair and transparent. Use one of these building quotes examples for free. It wouldn't be fair to give you only one building quote example, so there is another example and different type of framework for you to look at below. 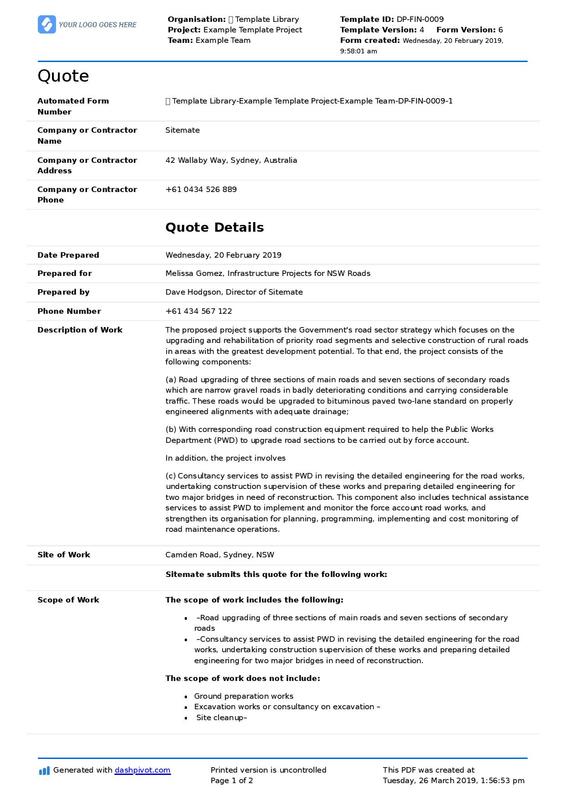 This example was used for a large scale construction and building project on some main roads. As noted before, the main difference between this quote and the other example is that this template has much more focus on the scope of work and project description. 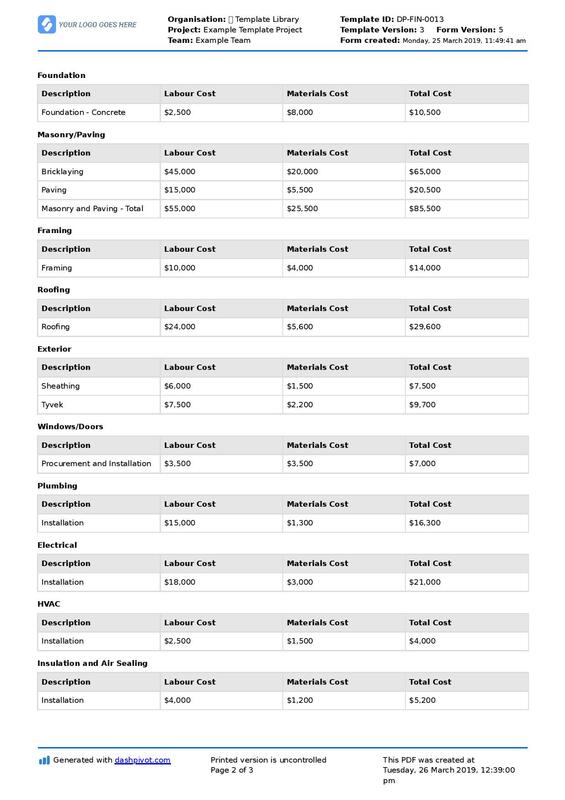 Because of the scale of this project, the cost breakdown (which is on page 2), is in much broader categories - and much bigger numbers. The scale of these projects is so large, that diving into too much detail around labour and materials would be unwieldy and problematic. 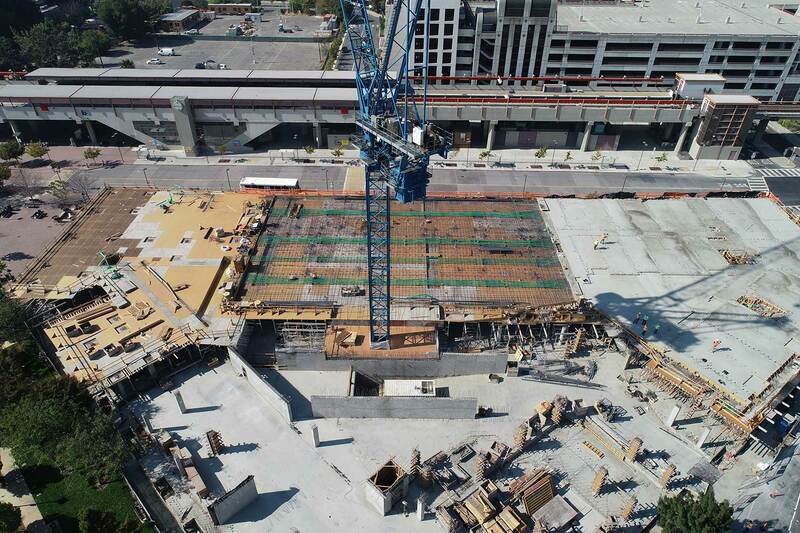 Contractors do their math on the costs and cost breakdowns, and then commit to delivering the project within those bounds. In this case, they bear a lot of the cost and financial risk. Because of the scale of this type of project, there is also some additional detail around major equipment and the payment terms. These type of projects can span many years, so some quotes will flag payment terms as well. 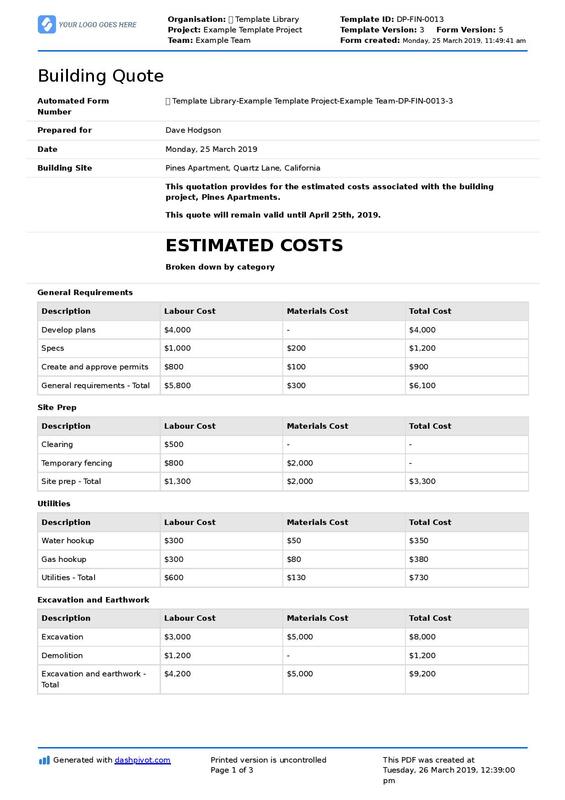 You may be more comfortable using or copying a building quotation example like this, or you may prefer the previous table and cost-heavy example before. How are these building quote examples created, managed and exported? Creating, managing and sharing your building quotes can seem like a serious mission at times. Maybe you have to create a template in word, fill that out, export that into PDF, and then send it via email. And then you have to rinse and repeat the process for your next quote as well. Luckily there are easier and smarter ways to manage these documents. The building quotes examples you saw above were both created in and exported with Dashpivot. A smart document management software like this enables companies to digitise their quoting process from start to finish. These means that they can create an entirely digital template, which can be completed and then exported in a PDF document inside of one system. This removes the need to jump back and forth between systems and spend time formatting documents. And when a new quote needs to be created, they can just clone one of the previous building quotes and adjust and modify it to suit the new project. Instead of spending valuable company time doing admin, companies and workers can spend their time making more accurate forecasts and creating more comprehensive quotes. There are a lot of things which building and construction companies can do better when it comes to quoting and winning work - and some of them are easier than others. You can instantly improve your quotes by using one of the building quote examples above (or below), which also gives you a glimpse into what is possible when using software and smart systems to manage these critical company documents and workflows. 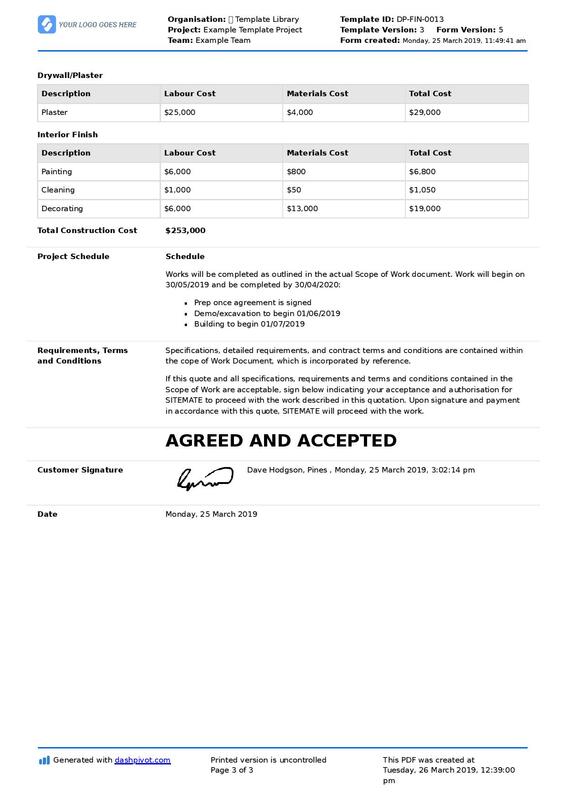 Use this construction quote template to make your quotes more professional and to win more work.